See the new product video here and learn about how thermal imaging can make nighttime driving safer. Armor Outlet's FLIR PathfindIR thermal imaging driving system kits now permit 24/7 all weather FLIR capabilities. With it you to see a person or animal in the brush out to 2000 feet, disturbed road beds or objects on or near the roadway, recent tire tracks, an idling vehicle, a weapon under a shirt or defeat blinding lights obscuring your vision. If the camera is mounted high you can see over the crest of hills or conditions ahead of the vehicle you are following. In addition, with our all weather kits you can now see much better in dust, rain, snow or fog, too. With our air lens goggle system the lens remains clear regardless of conditions. The first fleet order for this new system (cowling mount w/wash) was to reduce accidents for their pickups/light trucks that have to deal with dusty roads in the summer and snow, ice and migrating animals in the winter. The first industries to adopt FLIR vision systems were the mililtary, police and fire. Now the FLIR PathFindIR Infrared Camera is an option on the new 5. 6 and 7 series BMWs. It is amazingly small with unmatched performance. PathFindIR is so compact it is easy to install in any vehicle. The camera body measures just 2.3" x 2.2" x 2.8" (58mm x 56mm x 71mm), and weighs only four ounces (113 grams) making the PathFindIR easy to fit in your vehicle regardless of potential space, weight, or power limitations. It has up to a 2000 foot range with a 36 degree field of view. The camera output is NTSC or PAL depnding on country so it can be ported into a navigation system or for optimum performance, you can mount a small widescreen monitor at the base of the windshield or use an in–visor or in–mirror monitor. MONITORS ARE NOT INCLUDED! Are all vehicle night vision systems equal, absolutely not! Below is an comparative illustration. 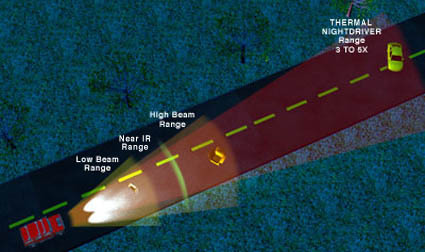 As you can see foreword looking infrared (FLIR) systems provide significantly better performance at highway speeds than either near–infrared systems (NIR) or headlights. NIR CCD systems do provide better definition at close range and low speeds at night. The other major selling feature to manufacturers is the camera can be mounted behind glass. That said, now to their limitations. They depend on IR auxiliary driving lamps to see, they are are sensitive to bright lights, have limited depth of view (light source) and if the auxiliary lamps get dirty or covered with snow/ice it blinds the system. Also, they can only be used under dark conditions and provide no real advantage over headlights at highway speeds. NIR systems are found OE on Mercedes and Lexus vehicles. Toyota further cautions "Factors including cold weather and the vehicle's air conditioner may limit the effectiveness of the system." Therefore, they ineffective when they may be needed most rural highways at normal travel speeds, or during-dawn to dusk daylight conditions, or in fog, dust, rain, smoke etc. FLIR (or FIR) systems on the other hand, work well regardless of light conditions, can see through dust, smoke and in bad weather provide vision greater than the human eye. FIR systems are found OE BMW, Honda (Japan), Cadillac Deville, Hummer H1 and H2 and one model of Fleetwood Coach. This is the same 24/7 technology you see used on military targeting systems and for police aircraft search systems. Moreover, the cameras can be integrated with NTSC capable monitors, including factory navigation systems on Range Rover, Audi, Infinity and many many more. Please inquire and we will be happy to advise which is best for your application. MOUNTING: Mounting kits come in two forms, behind grill and bumper mounts where you may have to drill holes in grill or facie, or a high mount system located at the corner of the windshield/cowling, where the camera is close to eye level for optimum performance and out of harms way, too. Please specify hidden or cowling mount when ordering. The camera’s aperture size is only 3/4 of an inch. On sedans, SUVs and pickups the most popular and effective place to mount the camera is on the cowling. That being said, the higher you mount the camera the better the field of view allowing you to see over the crest of hills and the safer camera is from rocks and road debris. For those that what the optimum location we are working on an aerodynamic roof mount with our al weather lens goggle. Some prefer to mount it behind the grill or in a bumper opening, and because the camera has a focal point of 3 feet it can also be mounted behind a screen or open grill pattern. Cowling mounts DO NOT require holes to be drilled into exterior body panels. The cowling option is an enclosed housing and bracket system that protects the camera. It also has a built in camera wash system. The housing is only 3 inches wide and 3.5 inches long and the top of the camera sits only 4.5 inches above the cowling/fender. Specify year, make and model of vehicle system is being installed on. If you require a complete installed system or advice on which would be best for you, please contact us. Any monitor that will play a video can be used, but a backlit screen that is close to your field of view with the largest practical image (wide screen). For motorcycles, race vehicles, performance sports cars and or security personnel a HMD (head mounted display) significantly improves the usability of the image and function. Depending on HMD the apparent display size can be between a 13 to 21 inch monitor without obstructing the drivers view or impairing night vision. In race vehicles the driver and codriver call up different screens or telemetry without have to stare at fixed point on the dash. 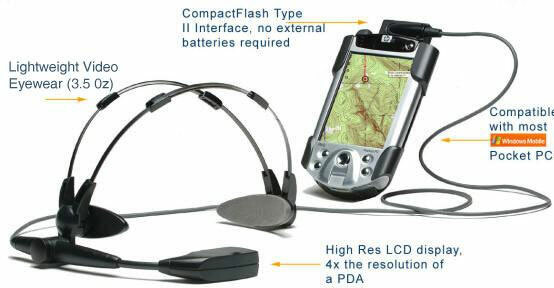 These system can be mounted on glasses, have their own headband or be mounted in a helmet. In fact, we have had several request for motorcycle helmet mounts for areas where there are high levels of migrating deer, elk, moose, wild horses or open range. Important: FLIR systems are subject to strict export controls and cannot be exported without an export license. Use in Canada or the US permitted. If your application is outside the US we can help you with this process. Exciting News! As of December 2006 we now have an 9 hz export model that does not require an export licenses and it is available in either NTSC or PAL formats. For use outside of the US we need an export license for the 30 hz versions that specify end user and application. We handle the Commerce Department export process. If you wish to purchase a 30 hz version for use outside the US or Canada please fill out and send us the following export form.